Although you may love the look of stone or ceramic tile flooring, it may be well beyond your budget. You can easily duplicate that look with luxury vinyl tile from our reputable flooring store. Easy to clean and soft to stand on, luxurious vinyl tile flooring comes in a variety of colors, patterns, and styles to suit your aesthetics and budget. Our customers are looking for value in vinyl flooring. At our locally owned store, the prices are very competitive. That is because we belong to a national chain that commands high-quality, brand-name flooring products at low prices. When you want attractive and affordable flooring, come to us. At our flooring store, we carry LVT, resilient flooring, and vinyl plank at prices that cannot be beat. Our flooring showroom is the place to shop when you want to see, touch, and walk on hundreds of options in vinyl floors. Talk with our knowledgeable flooring specialists to receive recommendations for your home. Modern manufacturing has made vinyl a better flooring option for you. This flooring is strengthened through the manufacturing process to withstand heavy foot traffic and resist scratches and scuffs. Luxurious vinyl flooring consists of four layers. The top layer offers a protective coating of urethane. Additional protection is provided in the second layer of clear vinyl. A third layer supplies the beautiful design that you see when you pick out your flooring. The final layer gives your resilient flooring stability and support. Vinyl is made to be the ideal flooring material. This flooring option looks good and lasts long despite trying conditions, such as heavy foot traffic and the activities of children and pets. Vinyl is often referred to as resilient flooring. This is because its construction make it well-suited to high-traffic areas. LVT resists water and stains, as well as tearing and gouges. 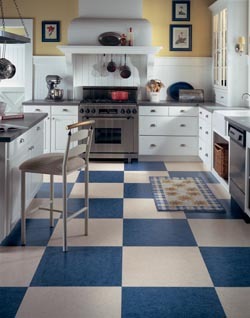 Vinyl flooring is easy to clean and maintain with very little effort. Sweep or dry mop on a regular basis and damp mop when needed. There is no need to scrub, seal, or wax your resilient flooring. Discover the exceptional strength and easy maintenance of luxury vinyl tile. Our customers love the convenience this high-quality flooring provides. Vinyl plank flooring is built to last. This flooring accurately represents real hardwood textures and colors for unmatched durability and impressive beauty. Available in authentic plank lengths and widths, you will find superior performance paired with a natural look. Today’s technology helps vinyl plank floors mimic the look of expensive hardwood, natural stone, or ceramic tile flooring. Vinyl plank looks like real wood because what you see is a digital photo of a piece of hardwood. Vinyl plank works well in busy households. These floors resist unsightly stains, discoloration, and dents, making them much more scratch and water resistant than real hardwood flooring. We recommend professional installation for the beauty and longevity of your vinyl plank and luxurious vinyl tile flooring. Ask our flooring technicians to install the resilient vinyl that you have picked out for your family room. We have the skill and experience to prepare the subfloor and install your vinyl flooring so that it resists damage. We are so confident of our products and services that our flooring store offers you several guarantees. Among these is our lifetime installation guarantee. Our flooring specialists will take care of any problems you may have with installation at no cost to you. In addition to our impressive selection of vinyl plank flooring and luxury vinyl tile, our customers will find unique flooring options in our spacious showroom to fit any home From solid hardwood flooring to soft carpet, our wide array of flooring products will instantly add value to your home. At our flooring store we make it easy for you to find your new floor. Our wide variety of high-quality products and competitive warranties are sure to suit your needs for floors that meet your needs in lifestyle, looks, performance, and price. Are you looking for affordable, high-quality luxury vinyl flooring in the Otsego, MN area? Contact Focal Point Flooring today! We proudly serve Otsego, Minneapolis, Maple Grove, Brooklyn, and Buffalo, MN. We proudly serve Otsego, Minneapolis, Maple Grove, Brooklyn, Buffalo, Elk River, Anoka, Rogers, Wayzata, Zimmerman, Princeton and Plymouth, MN.